Could this be the bird I had heard? I came inside to the computer and went here. I was pretty sure that the bird must be a Jay bird, but didn't know which kind of Jay bird. I typed "jay" into the search box and then checked out all the different Jay birds. Each bird "page" has a map showing the bird's range, along with other facts - one of the best features is - there are recordings of the bird-calls with each bird. 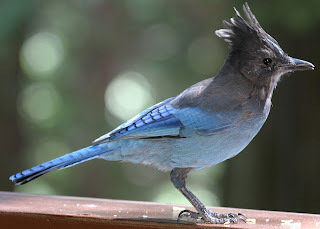 Using this wonderful feature I found out that our Big Blue Bird was a Steller's Jay. He/she stayed around off and on all day, flitting from the fence to the ground, peckng for goodies, then back up to the fence. I have only seen one Jay bird around here once before and that was probably five years ago or more. On the knitting front, I am still working on the ribbing for the "Anne" socks. Another inch or so and I'll change to #3 needles to finish the leg. Hallo! I found your blog by chance and I noticed you write very interesting. I love knitting too. Wish you good luck with your eye!